Published April 23, 2018 By Anna T. This post may contain affiliate links. Regardless, I only recommend sites I've researched and/or used and trust. One of the most common questions I get via email are from people who have slow internet connections and need to work at home. There are many people without hard-wired connections relying on satellite internet, or people who are relying on ISP's that are generally not all that fast. And unfortunately, this does disqualify you from certain work from home jobs. However, you do have some options even though you may think all hope is lost. Thankfully, not all work at home jobs are 100 percent dependent on good internet speed. There are more things you can do than you probably realize! For today's post, I've listed some work at home ideas for people who are dealing with slow internet speeds. Over the last year, I've come across a few different ESL (English Second Language) tutoring opportunities where you work through a smartphone or tablet. Cambly – Read Cambly Review – This is similar to the two I listed above, but you work using your computer while the people you tutor are using an app. There is no information listed about having high-speed internet, so it may be something to try. Palfish – Engage in chat via video with people from other countries, looking to learn the English language. It's an app you download and all work is done directly through it, so as long as you have a connection for your smartphone, you can do this job. The link I provided takes you to the app page in the Apple store, but it's also available for Android users. NiceTalk – Read NiceTalk Review – Another app very similar to Palfish, work basically the same. You work using the app (Apple or Android). I've had many readers do this work via their smartphones and report being paid. Tandem – App-based language tutoring. You must be a certified language tutor to qualify. All work is done via your mobile device. Many people make fantastic money freelance writing online. You do not need professional experience to get started, either, although it's true not everyone is cut out for it. If you have a good grasp of spelling, grammar, and research skills, you might do well as a freelance writer. It also helps if you find it simple to put your thoughts into words. Freelance writing is also an idea if you struggle with slow internet speed because you don't have to be online 24/7 as you write. Most of your writing can be done offline, anytime and anywhere. You will of course need to be able to submit your content to the person or company you're writing for via your internet connection and you'll need access to the internet to do your research. But freelance writing is not an industry where continuously stable internet is a must. Most companies offering remote phone work require that you take an internet speed test as part of the application process. This is because you have to be continuously connected to the internet so they can route their calls through to you one after the other. For this reason, most phone-based work at home is not an option for people with slow internet speed. However, there are a few exceptions. Some companies, particularly phone mystery shopping jobs, give you the freedom to use your personal cell phone for making calls. Keep in mind that the companies I'm going to list below tend to be best for extra money only. There may be some exceptions, but that's what most readers have told me after trying these. InteliChek – Read InteliChek Review – Phone mystery shopping. You can use your own personal cell phone to make the calls if you need to. The job listing does say you need internet access, but does not specify high speed. Perception Strategies – Read Perception Strategies Review – Healthcare phone mystery shopping. Tends to have more ongoing work if you're lucky enough to get accepted here. While you do need internet access, they are not particular on what type of internet you have. ARC – Yet another well-known phone mystery shopping company. They are not always open to new applicants. Mentored – This is academic tutoring that allows you to work from their app-based whiteboard. So you should be able to use a smartphone or tablet. There is nothing listed on the website about your internet speed. However, you do need either a degree or be working toward a degree to qualify to tutor for this company. I was disappointed not to find more academic tutoring opportunities you can do with slow internet speed. However, I expect there will be more of these because I'm seeing tutoring apps are becoming quite popular. Most companies hiring online proofreaders and editors, like companies hiring freelance writers, don't have any specific requirements regarding your internet speed. If you are able to download the documents to edit/proofread, then you can do most of your work offline. You will of course need an internet connection stable enough to download and upload documents. If this interests you, you can see a list of 25 companies hiring online proofreaders and editors here. Another idea is to go into business for yourself as an online proofreader, which means you call your own shots in regard to every aspect of your work. Many people do very well selling online. And while it's not exactly a guaranteed paycheck, it can certainly become that if you put enough time and effort into it. My mother has made her living this way for over 18 years now! And a stable internet connection is not a must because you don't have to be online all the time. You just need to be able to get your items listed. What you choose to sell is up to you, but many people sell crafts or vintage items on Etsy and sites like it, “flip” items on eBay or Amazon that they find at thrift stores, or even sell used electronics. You can go here to see a large list of sites to use for selling your stuff. While there is still no question that having slow internet speed does hold you back from earning money online, it isn't a complete deal breaker. And the good news is that I expect to see more and more opportunities for people with slow connections thanks to money-making apps and jobs you can do directly from your mobile devices. If you have any other options to add here, I'd love to know about them! Originally published October 21, 2016. Updated and re-published on April 23, 2018. I just got a mobile hotspot; it’s 4G LTE. So much better than my cruddy AT&T home wifi which constantly drops. Is 4G considered high speed by these WAH companies??? Hi Anna, You do a fantastic job. Keep up the great work. This is a really good topic. 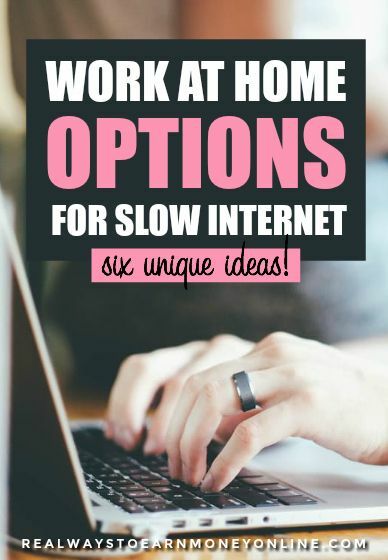 Low internet speed is a huge issue when it comes to working from home, and these idea are great! Also, if you don’t have internet at all, you can get a good amount of writing or editing done at a cafe or the library with free internet. If you have kids, find a place with a play space! That is a great idea, Faith! Thank you for sharing! This is a great list. I know there are folks who live in smaller towns and high speed internet could be hard to get. It’s good to know there are options out there for folks with slow internet. Thanks for sharing. You know I’m passing this along. Have a great week!